I’m still in lots of pain, but, a few things -have- changed. I’ve called a few lawyers and one seemed right on the ball about everything, sending someone out to talk to me and I might even be able to finally see a doctor tomorrow. Might also have a rental car to use until the entire thing is settled too. Tonight doesn’t get a post, Saturday’s aren’t special like the rest of the week. Might take Sunday off too this week. Blerghity. Lots of complications involving the accident, and I’m still in constant pain. *whine*. I’ve been posting MP3s on most of my posts as of late, and I thought maybe I should share some of the resources that are useful for picking up a song quickly. First up, songza.com it’s a clean and quick ajaxy type search engine for songs, you can stream them in your browser or download the results. This site appears ad-free. Thus gets my first vote. 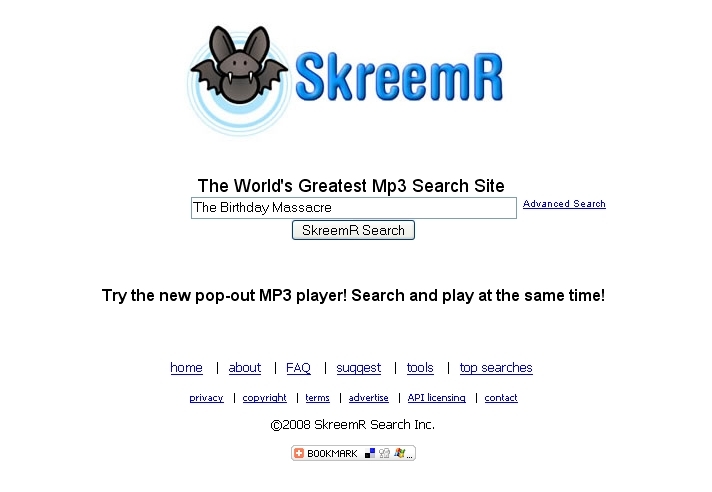 skreemr.com. It greets you with a minimalistic page similar of google, after entering your search terms you get a nice listing of the results and a bit of metadata about each file. mp3realm.org, another offering, seems to be much the same as skreemr, just rebranded. 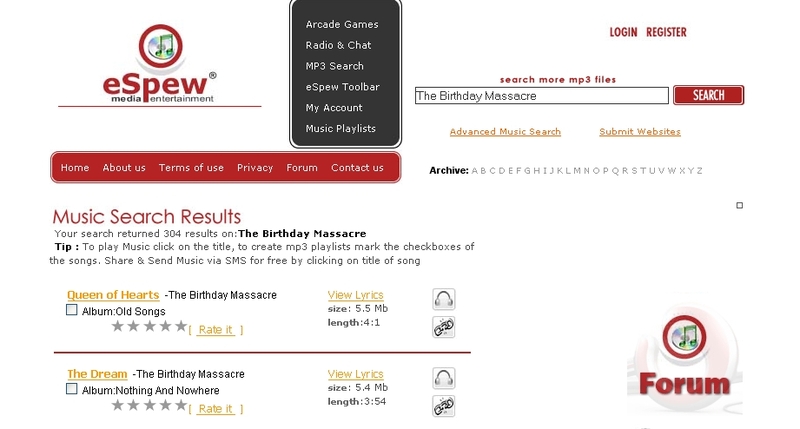 beemp3.com, has a bit messier of an interface and is very littered with ads, it’s search results also include the metadata about the song file. 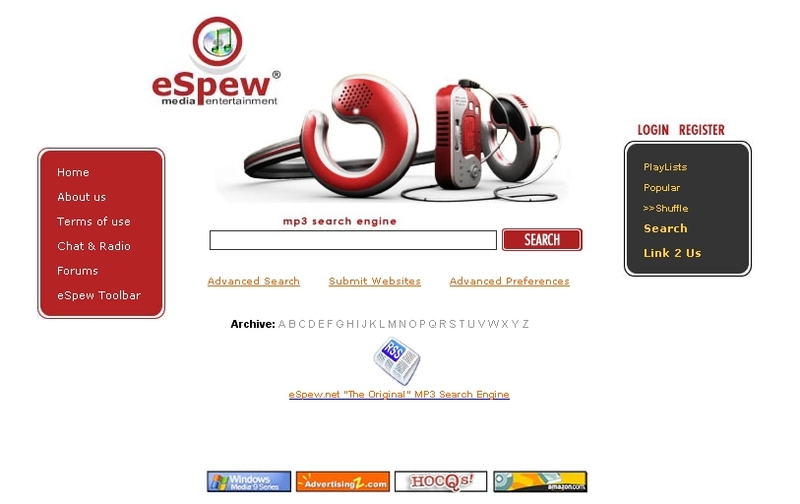 espew.com, appears much as mp3realm and skreemr, but doesn’t have as many obvious ads, there is an image on the search results that appears semi-ad-like, but it’s kinda hard to tell as it looks like it’s to a page owned by the espew.com maintainers. Despite having to cheat and edit after midnight, I still got the majority of the post in, I know, I’m bad about that. I made it in and I leave you with today’s song of the post. Two music services that provide similar services but through different bits of input. Last.fm is a social site that recommends music to you based on what other people that listen to the same artists as you listen too. This often leads to things that are of interest even though they’re not musically styled the same. Pandora on the other hand strips music down to specific elements and you can tell it a band you like and it’ll recommend other songs that sound similar in style to what you recommended. 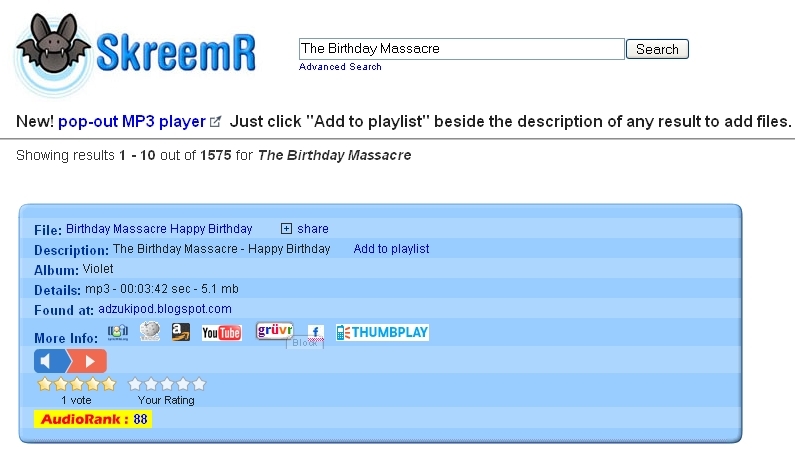 Today, last.fm lead me to find the group that I’m posting for the song of the day. Anyways, both services are worth a peek. I’ve been told that Pandora no longer works outside of the U.S. which might be a bit of a pain, but, it’s probably pretty easy to get around this limitation. This is yet another last minute post due to sleeping the day away to avoid the agony that comes with being conscious at the moment, it’s really putting a dull edge on this whole frequent posting thing, hope to get over this sooner rather than later. This, sadly, is becoming more habit then getting my post done is. For the past few nights it’s been close to the last possible minute for me to get a post in. I do have a good excuse, but, if I let myself get away with one I’d prolly let myself get away with all of them. So, minor life updates, got 500 lawyers all wanting to take my case on the accident, and I got the police report today. It has the witness’ name on it which is awesome since at the time of the accident I wasn’t quite aware enough to catch his name, can send him a thank you card at very least. The pain is still constant, today is the first day since the accident where I’ve spent more then an hour or two awake. If this keeps up I’ll be visiting a doctor to see if there’s something the initial exam missed or something. Also, I’d love to post another song today, but, for the life of me can’t come up with anything worth posting, so will have to let this post go songless. So, it’s not even one week in and I’ve missed a post. Although, my resolve in posting every day has allowed me to forgive myself for that considering the situation and I’ll just post twice today, and consider this early am morning post to be Saturday’s. I had planned a trip to the ranch for almost a week to go riding, and I was driving towards the ranch when out of nowhere some guy crashes into the rear of my car. I wasn’t stopped, wasn’t slowing down, and he still hits the car hard enough that it’s totaled. I spent most of the day in the hospital and then the rest of it crashed out on the medicine the doctor gave me. Today’s post goes to advertising a site that has a worthwhile mission. Instead of abandonware it catalogues games that have actually been made freeware by the owners and encourages developers of old software titles that have stopped selling their games to release them as freeware. Also, just to keep with the trend of posting a song on all my recent posts, here another.